9mm teardrops (from tip to tip) with the hole through the small end. 20% to 25% of the beads have cracks, and many beads have bubbles (although I don't count bubbles as defects). These were expensive beads. If I posted them at full price, they would have cost $4.00 per lot. But I took 25% off and posted them at $3.00 per lot. At the window in natural daylight. 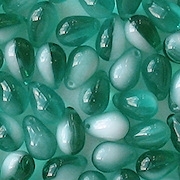 The color of the beads may differ slightly from the color you see in the picture. 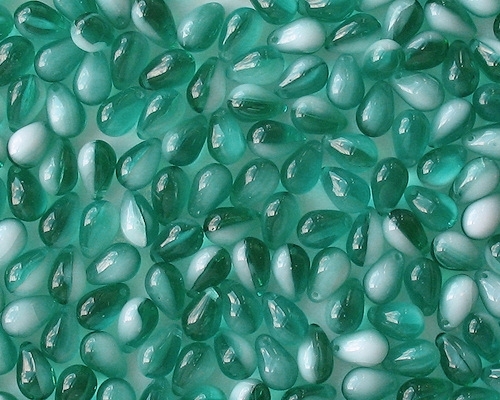 My camera made the beads look aqua, so I had to use my photo-editing program to shift the color to teal. I think I got it right, but I'm not sure. When ordering these beads, please be sure to order extra in case some beads have to be discarded. 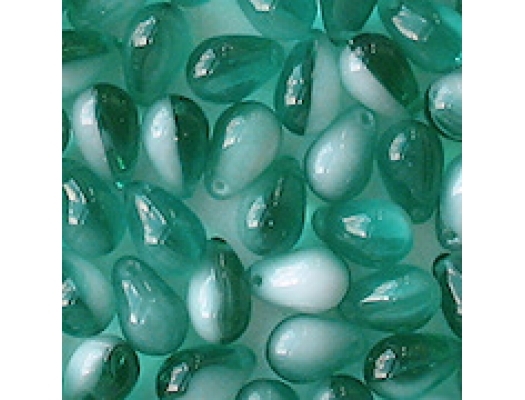 However, the cracks are not obvious, so you may be able to use all the beads that you order.